DB’s vision is 6/7.5 right and 6/24 left, pinhole 6/12. His eyes were quiet. He has quiet left corneal graft with no signs of rejection. 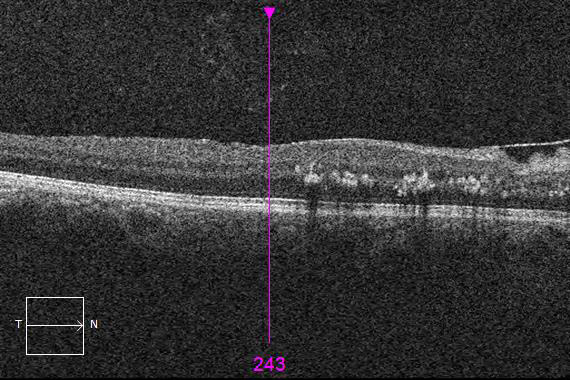 His retina shows evidence of neuro-retinitis, with hard exudates originating from both optic discs associated with disc swelling. There is also vasculitis, retinitis and retinal arterial aneurysm formation. Fluorescein angiogram revealed evidence of inflammation along the arterial walls as well as a marked disc leak. There is arterial aneruysm formation close to or at the arterial bifurcations. Later, scattered retinal non-perfusion led to neovascularisation in the retina in both eyes. DM underwent panretinal laser to both eyes to treat the retinal non-perfusion and successfully regressed the new vessels. The neuro-retinitis and vasculitis has clinically improved which is not the usual clinical course in these cases, which usually carries a poor prognosis.